(a) All traps set or used in this State must bear a durable and legible tag with the name and address of the person setting, using and maintaining the traps. The Division may issue a trap identification number to licensed trappers which may be used in lieu of a name and address. 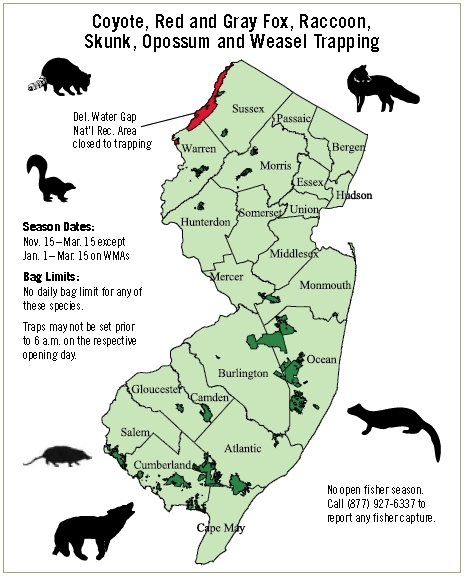 (b) No trap of any kind shall be permitted to remain set on any property at the close of the trapping season. It shall be illegal to possess, in the woods or fields of this State any conibear or killer type trap with a jaw spread greater than six inches except under permit for the trapping of beaver or otter. (c) No person shall set, use or maintain any type of conibear or killer-type trap for the purpose of trapping any muskrat or other furbearing animal in this state unless such trap is completely submerged underwater. This shall not preclude the setting of conibear or killer-type traps in tidal waters of this State for the purpose of taking muskrats, whereby the traps may be exposed above the surface of the water due to the ebb and flow of the tide, and provided that all such traps shall be completely submerged at mean high tide. (d) No conibear or killer-type traps with a jaw spread larger than six inches shall be used or set in this State except for the trapping of beaver or otter. No conibear or killer-type traps with a jaw spread larger than 10 inches shall be used, set or maintained at any time in this state for the purpose of trapping any animal. Jaw spread shall be measured across the trigger of a set trap to the inner edges of the jaws. Use a steel-jaw leghold type trap. The possession of such traps by a person in the act of turning over the traps to a law enforcement agency. (f) Body gripping restraining snares shall be subject to the following requirements. No person shall set, use or maintain any type of snare unless they have first satisfactorily completed a division-approved snare training course and carry on their person appropriate certification thereof. Except when submerged underwater or when set for mink and muskrat as provided herein, all snares of the body gripping type used in trapping must be constructed of aircraft cable or crucible wire measuring 5/64 to 1/8 inches in diameter and be equipped with a swivel. Mink and muskrat body gripping snares must be constructed of aircraft cable or crucible wire measuring 1/32, 3/64, or 1/16 inches in diameter, equipped with a swivel and set within 50 feet of the mean high water line. Except when submerged underwater or when set for mink and muskrat as provided in this subsection, no body gripping snare shall be set, used, or maintained with a loop diameter average (arithmetic mean) greater than 12 inches. Mink and muskrat body gripping snares must be equipped with a stop to prevent the average (arithmetic mean) diameter of the loop opening from exceeding four inches. Except when set for mink and muskrat as provided in this subsection, no body gripping snare shall be set, used or maintained with the distance between the ground or walking surface to the top of the loop greater than 24 inches. No mink or muskrat body gripping snare must be set, used or maintained with a distance between the ground or walking surface to the top of the loop greater than seven inches. Except when submerged underwater or when set for mink and muskrat as provided in this subsection, no body gripping snare shall be set, used or maintained unless it is equipped with a stop six inches from the end to restrict loop closure to no less than six inches in circumference. (g) All natural baits consisting of fish, bird or mammal carcasses or flesh used in trapping with body gripping restraining snares must be covered or concealed from view except when placed or located at a distance of 30 feet or greater from any set snare. (h) Legally licensed trappers possessing a valid and proper rifle permit may carry and use a .22 caliber rifle and .22 caliber short rimfire cartridges only, to kill legally trapped animals other than muskrats. All traps set or in use must be checked, tended and maintained at least once in every 24 hours. (j) Authority: The authority for the adoption of the foregoing section is found in N.J.S.A. 23:4-13, 23:4-37, 23:4-38.2, 23:4-39 and 23:4-41 et seq. and other applicable statutes.